If you are looking for something classic but also a touch different and edgy, take a peek at the 1957 DKW F93, a Sonderklasse automobile produced through the collaboration of the DKW, Mercedes, and Audi companies. The Audi website shared a bit of information about the 1957 DKW 3=6 Type F93 Sonderklasse coupe, though the details of the collaboration with Mercedes was not covered. The 3=6 Type F93, which was first presented in Frankfurt at the International Motor Show, featured a body that was 10 centimeters wider than the previous DKW models. The company used the 3=6 reference to describe the fact that the three-cylinder, two-stroke inline engine performed like a six-cylinder, four-stroke engine. The engine had an 896 cid (cubic inch displacement) and could go up to 125 kmh, or just about 78 miles per hour. The ‘suicide doors’ were considered the most significant distinguishing feature of the F93, and according to the Audi company, they were designed to enhance occupant safety. The Type F93 was in production from 1955 through 1959 and 157,016 DKW 3=6 Type F93 Sonderklasse cars were produced. The DKW, or Dampf Kraft Wagen company was started in 1915 by Jorge Skaffe Rasmussen. ‘Dampf kraft wagen’ translates as ‘steam car company’ – named for the company’s early experiments in creating steam cars. The company proceeded through the years by developing a two-stroke engine that could be fitted on bicycles and eventually merged into a popular line of motorcycles. The first cars – well – petrol cars – produced by DKW were small, boxy, bicycle cars that seated a single occupant, though the later P-15 was considered the company’s first true car. Outside of the car world, sonderklasse refers to a class of small racing yachts – implying the DKW F93 is a land version of a small racing yacht. 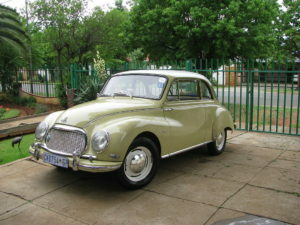 Looking to Buy or Sell a Classic Mercedes or Audi, Like This DKW? Part of the reason Classic Cars Online US exists is to help connect classic car buyers and sellers, and we’ve added several ways for you to connect – pick your favorite, or join us in all four places: (1) sign up on the Classifieds page here on the site, (2) visit and like this site’s Facebook page, (3) the Best Classic Cars for Sale page or (4) join the Classic Cars Online: Classic Cars for Sale group if you are looking to buy or sell vintage DKW, Mercedes and Audi automobiles.